1. Ahead of beginning of work on the Budget for 2016-17, government designated Ratan P. Watal as new Finance Secretary even as a new team of officials took charge at the finance ministry. Shaktikanta Das, 58, took charge as the Secretary for Department of Economic Affairs after Rajiv Mehrishi on his last day in office was appointed Home Secretary for a two-year tenure. Das, who was Revenue Secretary, has been succeeded by Hasmukh Adhia. Adhia, who held the post of Secretary in the Department of Financial Services, passed on the baton to Anjuly Chib Duggal. 2. Senior IAS officer Raghav Chandra has taken over as the Chairman of the National Highways Authority of India (NHAI). Chandra succeeds Road Transport and Highways Secretary Vijay Chhibber who was given the additional charge of the key post in June this year for three months after relinquishment of charge by former Chairman R.P. Singh on completion of his tenure. Raghav Chandra is an IAS Officer of the 1982 batch Madhya Pradesh who has held important positions in the central government and the Government of Madhya Pradesh. 3. The American Federation of Muslims of Indian Origin (AFMI) has honoured India-born entrepreneur and philanthropist, Frank Islam with the "Pride of India" award. India's Consul General in New York Dnyaneshwar M. Mulay conferred the award upon Islam who had donated $222,000 in May this year to the Aligarh Muslim University in India. 4. Kenya created history by topping the medals tally at the 15th World Athletics Championships that concluded at Beijing. With 7 gold medals, 6 silver and 3 bronze (total 16) Kenya was at top spot ahead of Jamaica (7 gold, 2 silver and 3 bronze) and the United States (6 gold, 6 silver and 6 bronze) had to be satisfied with the third position. It was the best ever finish for Kenya in World Championships as the country once again performed exceedingly well in its traditional domains of middle- and long-distance running. 5. The government appointed outgoing Home Secretary L.C. Goyal as the Chairman and Managing Director of India Trade Promotion Organisation (ITPO). The Prime Minister approved the appointment of L.C. Goyal (1979 batch Karnataka cadre IAS officer) as Chairman and Managing Director, India Trade Promotion Organisation. Earlier, Goyal had sought an early retirement, 17 months ahead of schedule, for personal reasons which was approved by the government. 6. Delhi's Deputy Chief Minister Manish Sisodia was given the additional charge of the Law Ministry of the city. Sisodia, who is the third person to hold charge of the portfolio in less than seven months, will replace Kapil Mishra. Kapil Mishra, an MLA from Karawal Nagar, was handing the Law Ministry portfolio ever since Jitendra Singh Tomar was arrested in a fake degree case in June 2015. Mishra will continue as Minister for Water and Tourism and Delhi Jal Board’s chairman. 7. 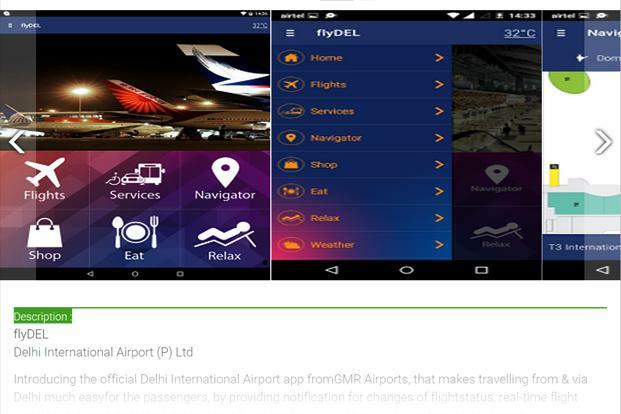 Delhi International Airport Limited (DIAL) launched a new mobile app service named flyDEL that aims to augment the passenger experience and provide them facilities. The app, which is available for both Android as well as iOS based devices, covering a majority smart phone users in the country, provides real-time flight information and access to all passengers’ facilities available at the airport among others. 8. England batsman Ian Bell announced his retirement from one-day internationals to concentrate on prolonging his test career. The 33-year-old Bell gave signals to retire after winning Ashes series. Bell is the highest scorer batsman in ODIs from England. He has scored an England record 5,416 runs with the help of four centuries in 161 one-dayers. 9. Union Government identified 305 cities and towns spread across nine states of the country for implementation of its ambitious ‘Housing for All’ scheme under which assistance of over Rs. 2 lakh crore would be provided over the next 6 years for enabling two crore urban poor own their own houses. The selected cities and towns are in Chhattisgarh (36 cities/towns), Gujarat (30), Jammu and Kashmir (19), Jharkhand (15), Kerala (15), Madhya Pradesh (74), Odisha (42), Rajasthan (40) and Telangana (34). Under ‘Housing for All’ scheme, two crore houses are targeted to be built for the poor in urban areas by year 2022, coinciding with 75 years of Independence. ‘Housing for All’ scheme was launched as Pradhan Mantri Awas Yojana by Prime Minister Narendra Modi on 25 June 2015. 10. Renowned neurologist and author Oliver Wolf Sacks passed away in New York, the USA. He was 82. Compared to his career as a practitioner of neurology and an academician he was better known as the author of best-selling books on the grey matter like Migraine, Awakenings, The Mind’s eye, etc.